Like great wine, great candy takes time. 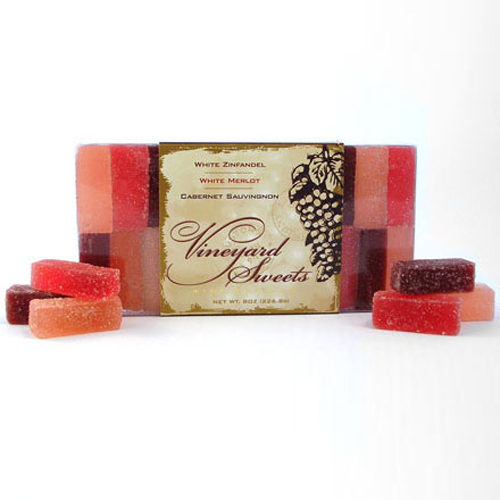 Each handmade batch of these wine jelly confections is made with real wine and takes several weeks from start to finish. Our assortment box features Cabernet Sauvignon, White Merlot and White Zinfandel. Wonderful with cheese and crackers, after a meal, or as a hostess gift. Lightly dusted with sugar and hand-packed in a clear box for a colorful display of jewel-like sweets. Ingredients: Sugar, cabernet sauvignon, white merlot & white zinfandel wine, corn syrup, pectin and tartaric acid. Additional information from the manufacturer: Manufactured on equipment that processes tree nuts and in a facility that uses peanuts. Each 8oz box contains approximately 22 pieces. I love these Pates de Fruits, I ordered the first batch from the actual website of the store that makes them, and shortly after found them here and for cheaper!! Cant beat that with a bat lol. I will be ordering these again! I had given these to some dear friends for Christmas, who are wine lovers. They loved them! I highly recommend especially if you are looking for a fun gift. Tasty & fun! These candies were surprisingly delicious!! Wine is not my favorite thing however this makes me think again. Very tasty treat! How can these taste like wine and at the same time taste like an exceptionally good candy. But they do. And I only like dry wine! Why just bring a bottle of wine to a party? Show some creativity and bring these instead! I gave these wine pates as Christmas gifts, and the recipients loved them.